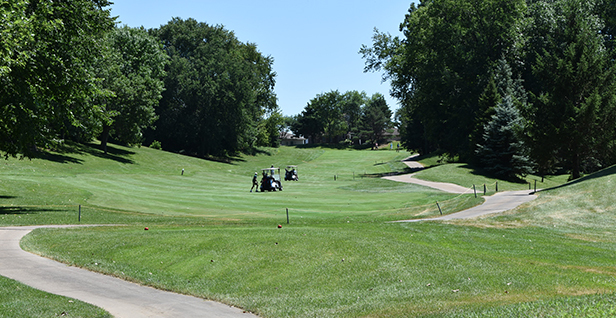 Muscatine, Iowa – The first round off the Eastern Iowa Junior and the Eastern Iowa Pee Wee were played today at Muscatine Municipal Golf Course. The second and final round will be played tomorrow at the Geneva Golf and Country Club. Click here for full results. The second round will begin tomorrow at 9:30 a.m.
Ryan Rochholz and JT Manjoine are tied for first place in the Boys 16-18 Division. Both Rochholz and Manjoine carded a 1-over-par 73 in the first round. Rochholz and Manjoine each tallied three birdies in the first round. Gavriel Beardsley is just one stroke behind Rochholz and Manjoine, finishing the first round with a 2-over-par 74. Beardsley carded two birdies during the round and an eagle on the par-5 18th. Anna Nacos holds a seven-stroke lead in the Girls 16-18 Age Division heading into round two. Nacos carded three birdies, including two-a-row on Nos. 14-15, to shoot 6-over-par 78. Mary Edwards and Maris Weeks are currently T2 at 13-over-par 85. Matthew Briggs is the leader of the Boys 14-15 Age Division after round one. Briggs carded a 4-over-par 76 with two birdies in the round. Briggs currently holds a 27-stroke lead in the Boys 14-15 Age Division. Jaci Webb is the leader in the Girls 14-15 Age Division. Webb recorded four birdies to finish the first round at 8-over-par 80. Erika Holmberg is in second place in the Girls 14-15 Age Division after shooting a 19-over-par 91. Jason Runbom sits atop the Boys 12-13 Age Division after finishing round one at 5-over-par 77. Runbom poured in two birdies on the front nine, and currently has a three-stroke lead. Charles Allen trails Runbom by three-strokes in the Boys 12-13 Age Division. Runbom tallied three birdies on his way to an 8-over-par 80. Lauren Briggs holds a one-stroke lead after day one in the Girls 13 & Under Age Division. Briggs registered a 10-over-par 46 on nine holes today. Eden Lohrbach is just one stroke behind Briggs following her 11-over-par 47 in round one. Elizabeth McVey is currently in third place. McVey finished round one with a 12-over-par 48. Roman Roth leads the Boys 11 & Under Age Division after carding a 3-over-par 39 in his 9-hole round today. Rajan Roth is just three strokes behind him. Roth finished round one with a 6-over-par 42.